With the Pink Floyd Live at Pompeii film due to be released on DVD this October, we are seizing the opportunity to take a much closer look at this enigmatic documentary. Over the next four monthly installments, beginning now, I'm going to explore the full range of the film's many cinematic facets, culminating with a comprehensive review of the DVD soon after release. I think to best understand the total dynamic of Live at Pompeii's intricate construct, you must observe it with untainted senses to obtain an objective perspective, which is not an easy task with a thirty year old film let me tell you. Having said that, if you are a long time Pink Floyd follower and/or are visiting this most excellent Brain Damage web site regularly, you may think there are no new surprises or perspectives in regards to Live at Pompeii worth noting, and certainly no relevant information left uncovered. Or is there? On a purely personal note, my first exposure to Pink Floyd was at a midnight cinema screening of the Live at Pompeii film way back in 1974. I did not have the realization at the uncorrupted age of twelve, but this momentous occasion was to be a pivotal turning point in my life, and despite being forewarned that the Floyd were unconventional if not downright weird, they intrigued me to point of crawling out of my skin. With great anticipation I entered the darkened movie theater with no preconceived expectations and left some ninety minutes later with my innocent perceptions completely shattered. Live at Pompeii exposed me to a whole new musical terrain, one with no established borders or rules, composed by intrepid explorers thinking way outside the map. To my amazement, the Floyd's musical virtuosity often soared ecstatically into heavenly realms, deconstructed fearlessly into chaos, or drifted aimlessly to surreal visuals that were integral to the whole experience. In retrospect, the Live at Pompeii film was a groundbreaking music documentary, and its considerable influence on the popular entertainment scene today cannot be underestimated. But where are we now? As recently as last year (2002), the upstart Aussie group The Vines released a volatile music video for their debut single "Get Free." The setting is strangely familiar; a young rock group playing with great bravado live in the white desert sand, framed by sound equipment and huge lighting towers. While the video is a subtle homage to Live at Pompeii's serene outdoor footage, the overall tone changes drastically by video's end, watching as all hell breaks loose as The Vines are singularly decimated by mother nature's stormy wrath. Directed by Sophia Copella, daughter of director Francis Ford Copella, and famous for her directorial debut movie The Virgin Suicides, The Vines "Get Free" music video marks the latest revisiting of Live at Pompeii's inimitable cinematic style. But undoubtedly the most outstanding music video to be fully influenced by Live at Pompeii's rich atmosphere is the Beastie Boys' (1992) offering "Gratitude." Shot on location in exotic New Zealand by director David Perez, it frames the former obnoxious Rap group as a gritty post-punk groove band, set outdoors bathed in brilliant daylight right in front of a steaming azure blue lake. 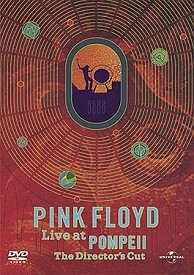 All of Live at Pompeii's now classic camera techniques are utilized such as slow steady camera panning, picture-in-picture, overhead shots of the drummer, close-up shots of bass guitar fretwork and full screen grids of guitar solos, and the liberal use of blue screen background techniques. However, the most obvious influence is a more literal one; the slow panning of speaker cabinet rears sporting the stenciled words "Pink Floyd London." Perhaps the obvious Floyd reference is not such a coincidence after all. Some time before the "Gratitude" video shoot, the Beastie Boys appeared on MTV news speaking about how they were searching the world over for vintage musical instruments and old sound equipment to add some groovy sounds to their Hip-Hop infused catalog. Nevertheless, it was quite a coup for the Beastie Boys to procure some of the Floyd's old retired speaker cabinets to elevate their street credibility. Further on in the "Gratitude" video, without missing a stylistic opportunity, shows the boys trudging through the dense desert sand submerged by billowy fog, similar to the Floyd's brief but adventurous sojourn outdoors near Pompeii. While another very impressive scene in "Gratitude" features a panoramic shot of a vast channeled mountain, to equate the similarly diverse countryside shown in Live at Pompeii. For the insatiably curious among you, you'll find this compelling video and other ground-breaking selections, including those videos directed by Spike Jonze, on The Beastie Boy's Video Anthology DVD (2003). Nowadays you simply cannot read much of anything about Radiohead without the article or review referencing Pink Floyd as a key influence by way of musical osmosis. With the overwhelming commercial and critical success of their 1997 release Ok Computer, Radiohead found themselves drawing comparisons to Pink Floyd's legendary status. Yet in a strange turn of events, during Radiohead's 1998 tour documentary Meeting People Is Easy, one member relates this surprising bit of Floyd trivia; "There was a documentary done recently about Pink Floyd, and when it was shown to Pink Floyd they refused to have it released because it basically showed them going in and out of business meetings and board rooms, and discussing moving money around the place." Clearly from witnessing the incessant activity and oppressive tone displayed in Radiohead's documentary, you can clearly understand how stress on the road has impacted the members of Radiohead, much like the Floyd experienced in their post-Dark Side of the Moon era. While Radiohead's documentary had the atmosphere of creeping malaise and growing discontent with the music industry promotional machine, Live at Pompeii was for the most part constructed of wide open spaces, albeit those haunted by the specter of a volcanic catastrophe over a millennia ago. Director Adrian Maben, working closely with the Floyd's approval, chose to place the group in a Roman amphitheater in Pompeii, Italy during October 4-7, 1971. And in a conscious decision to avoid the Woodstock festival scenario where the audience often overshadowed the music, Maben instead set out to create a very empty, more austere setting with the simplicity and pureness of a Zen rock garden. Also conspicuous by his physical absence is keyboardist Rick Wright, although during the Pompeii interview footage you can clearly hear Rick's voice, at no time will you see his actual lips move. Moving back a few years ago on this, Maben in interview said he wished to reinstate some of Rick's candid interview sequences in the director's cut of the film, however at the present time, such elusive footage remains to be seen. Take a close look at documentary director Adrian Maben's film resume and you'll discover a varied and exceptional filmography. As seen here in Brain Damage news, his documentary Monsieur Rene Magritte (1978), takes a comprehensive look at Belgian surrealist artist Magritte, followed by his acclaimed Frames from the Edge (1989). This contemporary documentary written, directed and featuring commentary by Maben, focused on fashion and advertising photographer Helmut Newton, often known for his sexually charged photographic style, and starred among others, Charlotte Rampling, Catherine Deneuve, Sigourney Weaver and Karl Lagerfeld. One of Maben's latest projects spanning the years 2001-2003 includes a couple of films shot in South-East Asia entitled The Fall of the Divine Elephant. They compare and contrast the pampered life of the fabled white elephant to the struggle for survival of the ordinary Asian gray elephant reduced to begging in the streets to make a living. The winner of many international film awards, Adrian Maben lives and works in Paris, and has directed many carefully selected documentaries including musical and art films. He works often with his own camera and is particularly interested in the marriage and links between form, content and music. He is one of the directors who has successfully bridged the gap between films shot in 16mm or 35mm and recordings made on video. When Live at Pompeii had its American premiere in New York on August 21, 1974 (the UK in November 1972), the now legendary Pink Floyd documentary thrilled countless music fans, yet it also exposed the general public to director Adrian Maben's deft cinematic style. Now nearly thirty years on, the director's cut of Live at Pompeii will soon be released on DVD presenting the film as Adrian Maben intended to a whole new audience. Next time around in article number two of this Pompeii series, I'm going to steer clear from the somewhat arid world of cinematography and take a myopic look at the group's stellar musical performances and revisit the press and fans reaction to the film. After thirty years of walking through the sands of time, where will our curious journey take us?